With very little fanfare, iDVD is the world's easiest-to-use software for creating DVDs produced by Apple Inc. Specifically. iDVD allowed users to burn QuickTime movies, MP3 music and photos to a professional-looking DVD with super-cool menus that rival anything coming out of Hollywood, giving users the ultimate DVD creation studio right on their desk. However, for those who want to import DVD to iDVD for the sake of adding a dazzling slideshow in iDVD, making a fancy menu or burning a DVD of your own like a Hollywood one, you can do nothing but huff and puff for iDVD does not support DVD formats. Are you longing for importing DVD movies to iDVD directly? Well, there will be a bit of elation overwhelming you as long as you own MacX DVD Ripper Pro. Why so? Here allow me to give you some highlights of its new version. 1. Touting more than 350 output profiles for iDVD, iMovie, iTunes, iPhone, iPad, iPod, Samsung, HTC, etc, you can free feel to convert DVD to iDVD friendly format. 2. 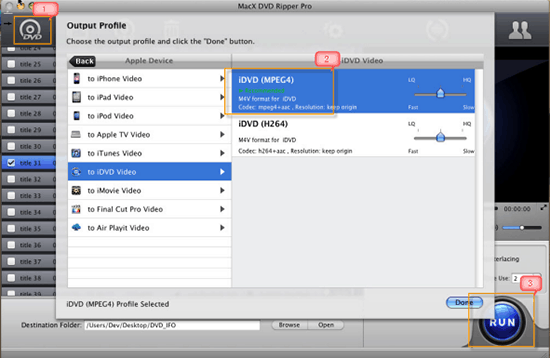 The brand new Apple-style interface offers a unique experience for both beginners and advancers, making DVD to iDVD conversion an Easy 1-Click Solution. 3. The unique DVD Navigator Analysis technology enables Mac users to easily get rid of copyright protection techs from DVDs, like Region Code 1-6, RCE, UOPs, CSS, Sony ARccOS, Disney X-project, etc., empowering you to copy protected DVD without any third party help. 4. Optimized DVD video editing functions let Mac user crop video file size, trim video segment, merge video files, import external subtitle file (*.srt) to realize different needs and get the best video quality. free download DVD ripper on Mac OS X, hit "DVD Disc" button to import DVD movie you want. Alternatively, you can import this disc by hitting "DVD Folder". After finish loading the DVD, a small table including 350 output profiles will pop up. Choose "to iDVD Video" listed on Apple device from the drop-down list. Besides MacX DVD Ripper Pro offers the best solution to rip DVD to iMovie, DVD to iPhone iPad iPod, DVD to iTunes, Final Cut Pro, etc with fast speed and utmost quality. By the way, you can also click "Edit" button to crop, trim and merge video files as you need. Start the DVD digitizing process by clicking "RUN" button. It's worth mentioning this Mac DVD converter delivers a unique feature - create a perfect DVD copy on Mac in a few minutes with video and audio quality the same as original, so that you don't worry your precious DVD collection being easily scratched or damaged. Notice: The DVD ripper developer only encourages you to rip and import DVD to iDVD for legal personal use, instead of illegal reproduction or distribution of copyrighted content. Please obey your local DVD copyright law before doing it. DO NOT do harm to others' lawful rights and interests. This is a full iDVD tutorial on how to use iDVD on MacBook Pro/Air/iMac to burn a DVD to DVD and burn projects from iMovie, iTunes, iPhoto etc. to a DVD disc to create backup, play on TVs, computers or share with others. MacX DVD Ripper Pro is specially designed to rip and import DVD to iDVD, iMovie, VLC, Final Cut Pro, iTunes, iPhone iPad iPod, Android Samsung Sony, Microsoft, etc. With High Quality Engine, it rips DVD to Final Cut Pro MP4 or MOV with 98% quality kept.